Spring is all about new life. It is such a wonderful time of year here in the northeast. After a long and often gloomy Winter, Spring is here to lift our spirits. Of course the weather is always unpredictable, (well actually it is unpredictable here all year long ) but it has so much promise bursting forth from the ground to the trees. The renewal of life and new life is all around us. Dean and I are busy with new gardening ideas and every Spring there always seems to be one more garden expansion. This Spring there was a different kind of one more expansion that added more love to our family. We got to welcome a new baby boy into the family. 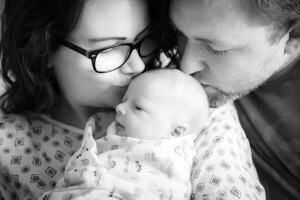 Our son and his wife had a beautiful baby boy, Boone McKinley added to their family. The middle name honors Papa (Dean) who climbed Mt. Mckinley 40 years ago. I’m sure this little man and his big sister will have lots of adventures of their own ( I think I heard someone talking about his first camping trip). We are so happy for them. Posted by Maryclaire Mayes on Tuesday, May 2nd, 2017 at 06:22 and is filed under General.